Don’t know where to buy fidget spinners? You can find one at Walmart, Amazon, or eBay. But what if you could win your own spinner? It’s the SweepstakesMag Free Fidget Spinner Giveaway! Wondering what is a fidget spinner? It’s a type of stress-relieving toy mostly used by school children and it’s probably the most wanted toy at the moment. Since it’s so popular, we decided to offer 10 lucky readers the chance to win one of the best fidget spinner. Want to win yours? All you have to do is complete any or all actions provided in the widget below to earn entries. The more actions you complete, the more chances you have to win. Good luck! 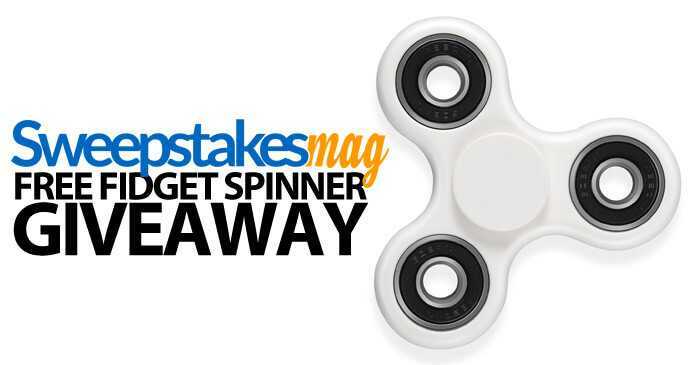 Eligibility: SweepstakesMag Free Fidget Spinner Giveaway (“Giveaway”) is open only to legal residents of fifty (50) United States and the District of Columbia who are at least eighteen (18) years of age (or the age of majority in their state of residence, whichever is older) at the time of entry. Void in Puerto Rico, all U.S. territories and possessions and all overseas military installations. Timing: The Giveaway begins at 12:00:01 a.m. Eastern Time (“ET”) on Wednesday, May 10, 2017 and ends at 11:59:59 p.m. ET on Wednesday, May 31, 2017 (the “Promotion Period”). Grand Prize Drawing: Ten (10) potential grand prize winners (“Grand Prize Winners”) will be selected from all eligible entries received in a random drawing to be held on or about June 5, 2017. The potential Winners will be notified via e-mail within five (5) days after the drawing to the e-mail address submitted with his/her Standard Entry. The drawing will be conducted by Administrator, whose decisions on all matters relating to the Sweepstakes shall be final and binding. Grand Prize: Ten (10) grand prizes (“Grand Prizes”) will be awarded in this Giveaway. Each grand prize consists of one (1) Fidget Spinner. Approximate retail value of each grand prize is $13.99.